This predated the Sixth Sense by a few years, so it's important to realize that RL Stine should have been nominated for an Oscar. That said, this novel was incredibly sad and elegaic. 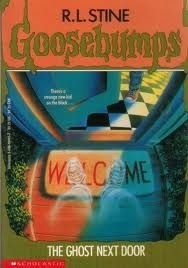 Outside of the Shadow-Danny stuff, which really just feels tacked-on to make the novel "spooky," it didn't really feel like a Goosebumps book at all. In fact, it is the only book in the series I've read thus far (with the possible exception of the Horrorlandone) that doesn't have a twist ending. The gravity given to the fact that the immensely likable narrator is the one responsible for the death of her family makes the book a heavier read than you'd expect.